The island of Boracay has once been hailed as the world’s best by “Travel+Leisure” magazine in 2012—only one of the many recognitions this famous Philippine tourist destination has received both here and abroad. Its fine, powdery white sand is its most legendary feature, which has lured local and international tourists alike for decades. The recent closure of Boracay for environmental rehabilitation has put the spotlight on the island more intensely than ever and for not so flattering reasons. Business activity and tourism have been halted, and locals are contending with decreased livelihood during the rehabilitation period. However, it has brought important attention to many issues such as waste management, tourism marketing, good business practices and others which, when addressed, will ensure Boracay’s sustainable existence for many more generations to come. Located about 315 kilometers from the capital city of Metro Manila and 2 kilometers north of Panay Island in the Western Visayas region of the Philippines, Boracay is a small island that is only 7 kilometers long and comprised of just three barangays, namely Yapak in the north, Balabag in the center and Manoc Manoc in the south. Aside from the several beaches, Boracay also boasts of lush forests across the island. For trekkers and hikers, Mt. Luho is a famous destination, with a peak that offers a breathtaking view of the coastlines especially those located in Yapak. A wildlife reserve can also be found where different types of snakes, monkeys and birds reside. The high season of Boracay is from December to April, where accommodations are difficult to find especially if you don’t plan and book accommodations before going to the island. May to June is also ideal, as these months are the Philippines’ summer season, but the temperature can get very high. July to November is the low season, when accommodations are relatively cheaper. Boracay was originally known as the “Land of the Atis,” named after its indigenous inhabitants—the Negrito or Ati. One well-known theory as to how the island got its name is that “Boracay” was derived from a local term “borac” meaning cotton, which may mean that there used to be vast cotton fields in the island or that the powdery sand of the beaches are apt to be described as soft and almost cotton-like in texture. According to other accounts, when Spaniards arrived and set foot on the island, they picked up shells on the shore and asked the Atis what the items were called, and they replied “sigay.” Later, the Spaniards asked them what they were planting and the Atis then answered that they were planting “boray.” a certain vegetable seed. From the words “boray” and “sigay” the name Boracay was thus formed. Finally, the most well-known theory is that Boracay came from the word “bora,” which means bubbles. The natives noticed the foamy appearance that the waves make when they crash into the shore, very much like frothy bubbles, thus the name. How and when did this small island off the coast of Aklan catch the world’s attention? Boracay came under the public radar when German writer Jens Peter published a book about the Philippines and particularly wrote about the exotic beauty of the small island back in 1978. International films like “Too Late The Hero” and “Nam’s Angels” also utilized Boracay as one of their filming locations back in the 1970s, and this is largely seen as a contributing factor to the island’s growing popularity as a tourist destination by the early 1980s. Before the entry of tourism, the Boracaynons—the people living in Boracay—made their livelihood through fishing and coconut plantation in the 1940s and 50s. Copra, the dried meat of the coconut, was used to trade with the people of Aklan for other goods and staples such as rice. An estimated 2.1 million tourists are reported to have visited Boracay in 2017, the highest number so far and a significant increase of 16% from 2016 figures. Most of the tourists come from China, followed closely by South Korea. 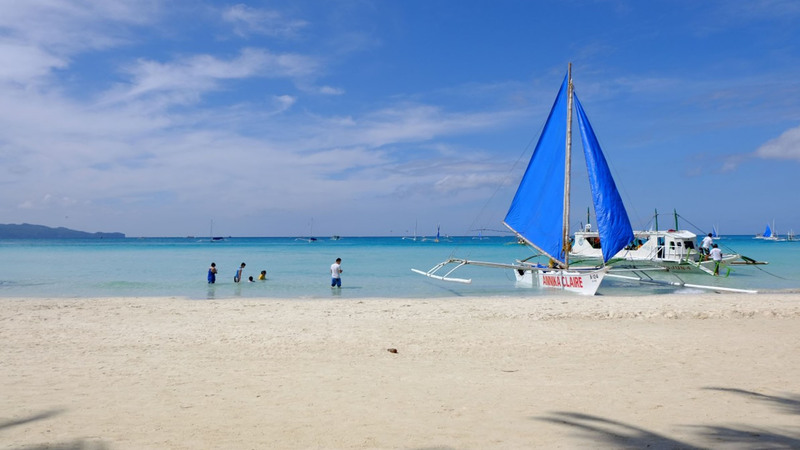 Because of this burgeoning tourist activity, it comes as no surprise that Boracay earned an impressive total of P56 billion, according to the Aklan Provincial Tourism Office. White Beach in Boracay is the most popular and lively coastline in the island, dotted with different restaurants, hotels and souvenir shops. Considered as the island’s epicenter of activities, this is where the Boracay nightlife is located. Various bars and clubs also line the shores of White Beach, where tourists have drinks and let loose. Those seeking a more laid-back tropical vacation can choose elsewhere in the island. Boracay actually has eleven other beautiful beaches to explore—two of which, though, are secret in location and not accessible by any public roads, quite hidden from the view of the general crowd. Some can only be reached by trekking through Boracay’s forests. Luxurious resorts and five-star hotels usually have their own private beachfronts exclusive to their guests. For backpackers & budget travelers, Boracay also has a lot of budget-friendly lodging. In fact, there are more of these pension-type lodging than formal hotels all over the island, making Boracay a popular destination for groups of friends and large families. Aside from swimming and snorkeling, visitors can enjoy many other outdoor sports and activities such as beach volleyball, cliff diving and parasailing. Paraw or boat sailing and riding on water contraptions like the fish flying are also popular. The Boracay bat cave located in the western part of the island is a well-known local destination. Conservationists have put a lot of effort in preserving the homes of these fruit bats and have since identified a total of three bat species including the Golden-Crowned Flying Fox which belongs to the endangered species in the International Union for Conservation of Nature Red List. Fruit bats are highly significant in the island’s ecosystem as they have an important role in tree regeneration, which preserves the Boracay forest cover. They disperse seeds as they take flight, scattering them all over the land. This natural activity accounts for as much as 95 percent of the regrowth of the island’s forests, a phenomenon that is extremely vital as the island’s forested area is now known to be dwindling slowly. Action is being taken to save the fruit bats because their population in the island has reportedly taken a whopping 86 percent decrease from 1988 to 2005, according to various conservation groups. This is because they are losing their natural habitat and are sometimes being hunted. Organizations such as the Friends of the Flying Foxes (FFF) are known to heavily campaign for the preservation of the various fruit bats species in Boracay. Due to the influx of tourists in Boracay, pollution and overdevelopment has been a concern. Despite the impression that the island enjoys year-round popularity, the truth is that there has already been a drop in tourist visits as early as in 1997 due to consistently high coliform levels in the waters. The presence of coliform means that water has been contaminated by feces or sewage. Moreover, algae bloom has been reported in 2015, illustrating more than ever the deteriorating condition of the island’s natural environment. It is also believed that human activity such as snorkeling and diving has been the cause of damage to as much as 70 percent of Boracay’s coral reefs. The good news is that significant reef growth has already been seen in the past few years, thanks to ongoing reef rehabilitation initiated by local non-profit environmental organizations. Through transplantation, the population of live corals in the island have been increasing annually since 2015. The closure and rehabilitation of Boracay has been deemed a much-needed rest that is for the benefit not only of the island’s natural resources but also of its inhabitants and enterprises. The target reopening of Boracay in October 2018 is highly anticipated, and by the looks of what has been previewed on social media and in mainstream news outlets, the outcome is nothing short of awe-inspiring and fantastic—with the island regaining the crystal-clear quality of its waters and its famous white sand becoming even more inviting. Many people have affirmed that this is the Boracay that they had known decades ago, before mass tourism and extreme commercialization took place. Even naysayers would be hard-pressed not to be convinced that the clean-up of Boracay has been quite effective. Moving forward, Filipinos are keeping their fingers crossed that with the right balance of governance and tourist activities, Boracay can remain this way and keep forever its reputation as one of the best beaches in the whole world. And it looks like they are still on track to the finish date. Hopefully, this rehabilitation fully helps the island heal once more; it doesn’t really matter if the healing takes years. Lastly, Pres. Duterte has stated that once the rehabilitation is done, he desires to distribute Boracay land to its natives and locals, and not to big businesses. Hopefully, the Ati community would also be included in these plans, and have their land officially be given CADT. The transition of Boracay Island from a peaceful and quiet stretch of beautiful white sand beaches to a highly commercialized hub of tourists and hotels and colorful nightlife can be a good thing, but everyone should remember that an island as beautiful as Boracay cannot be replaced and should be treasured and well taken-care of. The beauty of this exotic place does not come so effortlessly in this current setting anymore. We need to take care of Boracay, or else we’d simply lose it.